Nintendo has partnered with McDonalds to introduce happy meal toys to celebrate their upcoming Mario Kart 8 release for the Switch. Starting today through May 22 you can collect eight different toys from the world of Super Mario. 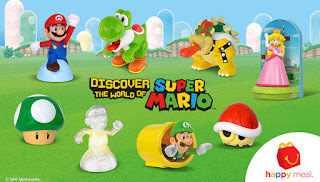 Mario, Luigi, Peach, Yoshi, red Koopa shell, 1-up mushroom and a invincible Mario. Each of the toys has it's own unique feature. If you use the McDonalds mobile app and scan your meal, you will also be eligible to win one of 100 Switches in the sweepstakes. So good luck hunting all eight collectables in the coming weeks. Surely they will easier to find then the NES classic mine.